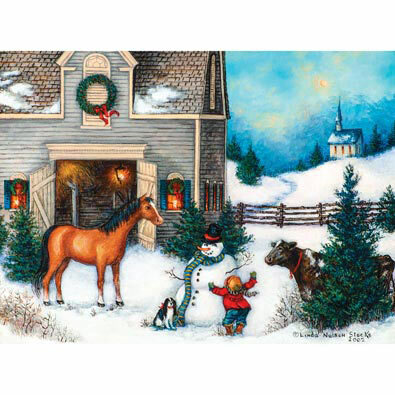 Home Again For Christmas is a 500 piece jigsaw puzzle designed by artist Linda Nelson Stocks. Families travel to church on a winter evening by sleigh and by foot. The barns and homes are decorated with wreaths and garlands for the holiday season. Available in two piece counts. Flag Street is a 500 piece jigsaw puzzle designed by artist Linda Nelson Stocks. Flags are proudly displayed on the front of each home in this old-time country village. Available in two piece counts. Cutter's Covered Bridge is a 500 piece jigsaw puzzle designed by artist Linda Nelson Stocks. A girl leads a calf through a red covered bridge in a farm town. Sheep are by the side of the road and horses are grazing in the distance. Available in two piece counts. Gathering At School is a 500 piece jigsaw puzzle designed by artist Linda Nelson Stocks. Children and their families are traveling to a red schoolhouse in a country village. The teacher waits by the gate to greet her students as they arrive. Available in two piece counts. The Village Green is a 500 piece jigsaw puzzle designed by artist Linda Nelson Stocks. The townsfolk have gathered in the center of town to greet their neighbors. Children play games as animals roam about in this quaint country village. Available in two piece counts.